The Sentinel System is increasingly recognized as a vital resource able to support the needs of diverse stakeholders, including other public health agencies, health systems, regulated industry, the clinical research enterprise, and patients. However, individuals whose data are used to support Sentinel, as well as the general public, are largely unaware of Sentinel’s existence, health and safety mission, and commitment to protect patient privacy. The mission of the Sentinel Stakeholder Engagement workgroup was to develop messages to inform engagement partners about the Sentinel System, letting them know what a valuable tool it is and how it works, and to remind them of the FDA’s commitment to protect patient privacy. The workgroup was led by a Patient Representative to the Sentinel Planning Board. Workgroup members included representatives of the patient community, health advocacy groups, providers, health plan members, the Sentinel System staff, and the FDA. The workgroup developed the Infographic below as well as targeted versions of the Sentinel System Story for each of the four engagement partners. The stories intended for the Public and Providers are shown here on the Sentinel website. The stories for Health Advocacy Groups and Health Plan Members were developed as templates for further dissemination by those engagement partners. The information provided in the Infographic and stories is intended to inform the public about the Sentinel System, but do not constitute official FDA communications. 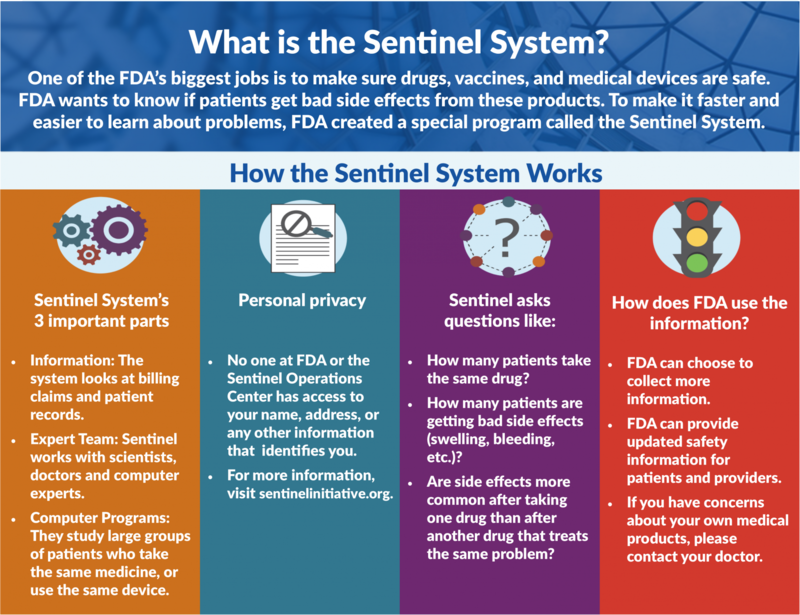 The FDA and Sentinel Operations Center welcome comments on the Infographic and stories at info@sentinelsystem.org.